Although Akala has been around for 10 years, he still remains one of London’s most infamous, independent hip hop artists. Despite the early fame, by winning the MOBO award for Best Hip Hop Act in 2006, Akala decided to pursue his career in line with his beliefs – as a full independent artist. Taking on such a role for artists, is in a strong sense a big sacrifice and we should be eternally grateful to Akala for doing so. His passion and commitment to truth speaking is what makes him such a unique artist and his performances so incredibly powerful. Akala has not only become one of Britain’s most important artists, but one of our generations most significant intellectuals and poets as well. Before the concert, I had been to see Akala speak at the students union about Black History in Britain. I learnt more in that two hours about British history then I did in the whole of my school career. His ability to speak so engagingly and eloquently while he condenses hundreds of years of detailed history into a single lecture proves him to be a truly gifted speaker and you are left in awe at his depth of knowledge. To go from this, to his performance in the Marble Factory of Motion could not have been more different. However, Akala still managed to completely blow the audience away, proving how extremely multitalented the man is. The performance itself was of course so much more than a musical experience. Opening with a montage of professionally edited, politically charged media clips, he invited the crowd to enter a conscious state. It was here that he reminded us that this is not just a concert. When the music started, he immediately burst into energy and took authority over the crowd, forcing us to follow every move, while we listened intently to his profound lyrics. This with the aid of a live drum kit, made it an electrifying experience. 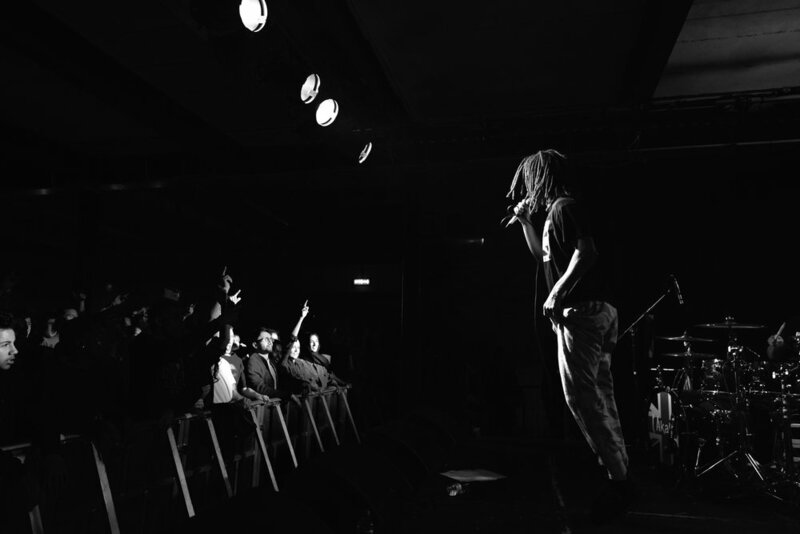 Throughout the show, Akala played a mixture of old and new material in celebration of his ten years, which took us on a journey of his musical career. Unafraid to rap and talk about the inherent inequalities, irrationalities and brutalities which dictate our society and govern our world today, Akala showed us the truth. This is why he has been able to pursue a career as an independent artist as he is so committed to his message and purpose and maintain a loyal and ever growing fan base. Of course, Akala ended with his legendary ‘Fire in the Booth’ series, a last demonstration of his perfect and effortless flow, and never-ending energy. An unbelievable performance from the incredibly talented Akala.